It seemed as though it might turn out to be a clear night at Harbourfront as The Stills and Hawksley Workman prepared to take stage for one of LuminaTO's free Masters of World Music shows last night. I caught a few people raising an eyebrow to the imposing looking clouds making their way across the skyline at Harbourfront, and for good reason. Despite all the bad news that made headlines this past weekend, there continues to be an unquestionable feeling of togetherness and celebration throughout the city this week. Between the opening of the ROM Crystal and the myriad of shows, performances and exhibits, there's definitely no shortage of reasons to get out and enjoy the city. Just after The Stills wrapped up Lola Stars and Stripes to a considerable and highly enthusiastic crowd, and Hawksley Workman took to the stage to many eager cheers, what can only be described as a perfect storm of nature, art, and music suddenly hit. The sun set, the Pulse Front lights lit up the sky, and the rain began to fall. I and many others made a dash to get under the partially roof-covered area inside Harbourfront Centre, where everyone was now standing, huddled together as Workman's lead, Ryan Corrigan, quipped, "Look, they've turned the fancy lights on!" and, "Oh it's raining!". While the music was a treat, the way in which the pulsing spotlights lit up the falling rain along the water as everyone gathered was just mesmerizing. The LuminaTO folks insist that love was in the air last night. Maybe there's some truth in that. LuminaTO's Masters of World Music continues throughout the week at Harbourfront Centre with performances by Funkadesi, Emeline Michel, Joe Vasconcellos, and more. Be sure to check out the LuminaTO blog and their Flickr group for more information and coverage of the festival. Photo of Hawksley Workman by eye-see. 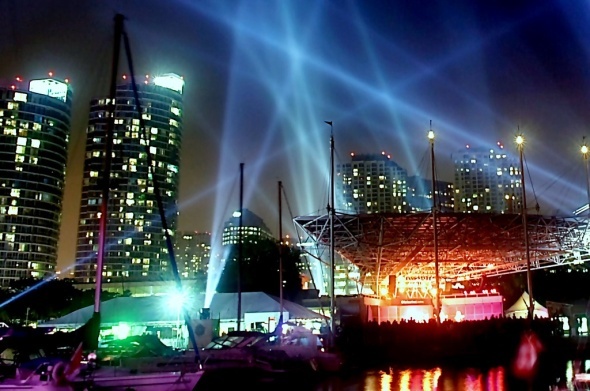 Harbourfront Centre photo by Bahman from the blogTO Flickr pool.